Ground Name: Priory Lane Capacity: 4,151 (542 Seats) Address: Sports Club, Priory Lane,Eastbourne, Sussex, BN23 7QH Main Tel No: 01323 766265 Fax No: 01323 741627 Pitch Size: 115 x 72 yards Team Nickname: The Sports Year Ground Opened: 1983 Home Kit Colours: Red & Black Official Web Site: www.eastbourneboroughfc.co.uk About Priory Lane Although the ground is one of the more basic in the Blue Square Premier it has many decent facilities that make a trip here one of the best of the season, especially if the whether is good. On one side is the smart looking yet small Main Stand. This covered, all seated stand, has a capacity of 542 seats. There are no supporting pillars, resulting in good views of the playing action as the first row of seats is set around 3 foot above the pitch. However, the stand runs for about half the length of the pitch and strangely has been built mostly to one side of the half way line. Opposite is a a small covered terrace, called the Peter Fountain Stand, that extends again for around half the length of the pitch. In one corner this meets the River End Terrace, which is covered. The opposite end, the Mick Green Stand, is a small covered area which is divided into two. The team entrance from the dressing rooms to the ground runs out from this end and above this stand is one of the two club houses which has windows for any people who dont feel like braving the elements on the terraces below. Thanks to Duncan Adams ‘s site http://www.conferencegrounds.co.uk for some of the above information. How to get to Priory Lane The ground is located on the edge of a smart residential area in the Langney area of Eastbourne, some 3 miles from the seafront, pier and town centre. The following directions are provided by Duncan Adams:- “From the direction of Brighton on the A27 take the A22 towards Stone Cross and Westham. At the next roundabout take the first exit again towards Stone Cross and Westham. Continue towards Stone Cross village until you will come to a crossroads, with a church on your left and the Red Lion pub on the. Turn right just past the pub onto the B2104 Friday Street. At the end of Friday Street, turn left at the double mini-roundabout into Hide Hollow (B2191). After passing Eastbourne Crematorium on your right, turn right at the roundabout into Priory Road. The entrance to the ground is about 200 yards down the road on the left. There is a good sized car par at the ground which holds 400 cars, which is free.” If you are coming by train then a taxi is needed and will cost around a fiver. There is a bus service (6a) that runs from the station to the ground every 30 minutes and costs £2.70 return. How to get a ticket for Priory Lane With an average attendance of just over 1,500 and a capacity of over 5,000 sell outs haven’t exactly been common in Eastbourne. The biggest game of the season tends to be the local derby with Lewes at Christmas and this only attracts around 2,200. Entry is £12.50 for Adults and £4 for Children. If you can bag yourself a spare seat in the stand then this is free. 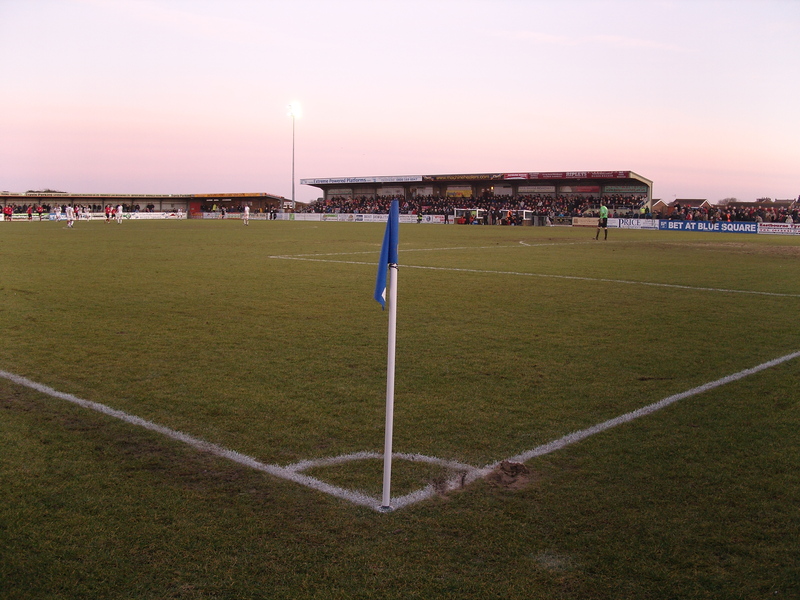 About Our Last Visit – Eastbourne Borough 2 York City 1 – 24th January 2009 Did you know that the sunniest place in Britain is Eastbourne? Neither did I until I tried to look for an angle for my first visit to the town in nearly two decades? Well according to the expert that is Wikipedia this is true. It is more famous for being the south’s “God’s Waiting Room”, where people over the age of 70 come to potter, queue up in banks all day and generally moan about the “youngters today”. It is also the nearest town to Beachy Head, the point on the south coast where people decide they have had enough of Brown’s vison of economic utopia and jump off the edge of a huge cliff. But did you know it is also home to one of the first and most successful Community Interest Clubs in England? Well there you go – Eastbourne Borough (not to be confused with Eastbourne Town or Eastbourne United who play in the lower leagues of Sussex non-League football are currently enjoying their first season at the highest level of the Non-League pyramid after their promotion from the Blue Square South division last season. They were promoted after a play off with local rivals Lewes but are fairing significantly better than their neighbours from down the A27 . In the first half of the season the club had produced some consistent form, sitting exactly 10 points below the play offs and 10 points above the relegation zone. It is a very commendable achievement considering the limited resources the club has when compared to the likes of York City, Mansfield Town and Ebbsfleet United who were some places below the club coming into the January game with York City. In the current world of the football merry-go-round it is amazing that the Eastbourne manager Garry Wilson was due to celebrate ten years in the role in a few weeks time. During that decade Wilson had taken the team from the Sussex County Leagues to the highest level of Non-league football, just one step off the Football League on a limited budget which has seen the club keep on an even keel whilst others around them had continue to boom and bust (who could ever forget the implosion of the Hornchurh club just a few years ago when they signed professionals such as ex-Chelsea keeper Dimitri Kharin on a four figure weekly wage whilst they were still in the Rymans League!). The club had been eliminated from all cup competitions by early January and so the plan was to concentrate on the Blue Square Premier League. Whilst the club never stated publically their aim, they will have been very pleased to have reached this stage of the season with so many points in the bank and so far off the relegation zone. With their neighbours Lewes finding life without most of their best players, who left in the summer, Northwich who were locked out of their stadium for financial issues and Grays who were trying to sell everything associated with the club, Eastbourne can look forward to at least another season in the Blue Square Premier next season. Their opposition for this almost end of season fixture already was York City, my second favourite team so far this season who I had seen at Salisbury City, Histon and Burton Albion. You know what to expect from York. They play a distinctive style which they try to neutralise any attacking play from the home team whilst relying on the pace of their young front two on the counter attack. I managed to get a Saturday pass for this one, taking the Little Fullers to swimming before heading off down the A22 for the game. The day before the match heavy rain had put the game into doubt. The small 5,000 seater stadium on the outskirts of Eastbourne had been developed along the lines of so many other lower team grounds, starting off as a small club house alongside a pitch when they were known as Langney SportsFC until 2001. 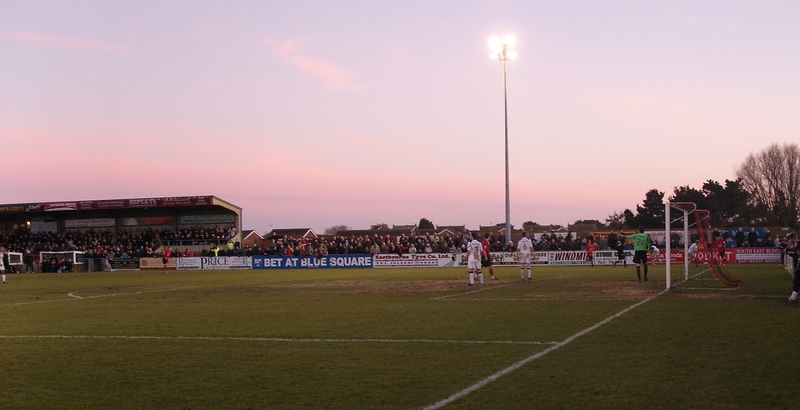 They changed their name in 2001 to identify more with the town where they were based as they entered the higher stages of the pryamid and work was carried out to improve the ground with the construction of a new small main stand and an upgrade of the floodlights. After a spot of fish and chips on the beach Lolly and I headed to the ground, which sits in the smart residential area of Langney, around 3.5 miles north east of the seafront. We managed to blag a street parking space, all of a 2 minute walk away which was disappointing considering my previous records of watching York at Burton and Histon. The ground has two sports bars which were full to the brim when we arrived, with fans from both teams enjoying the warmth of the interior as well as a few pints to prepare them for the cold outside. York had brought a few fans, including what appeared to be a group of a dozen or so young “boys” who obviously wanted to see how quick they could be ejected or arrested. They started by unfurling a few banners in the run up to kick off, and then proceeded to act as if they had downed a case of Strongbow each instead of the Tizer they were actually drinking. Not to be outdone, Eastbourne had a chap dressed as Captain America…I did ask him why – his response was “Superman outfit is in the wash today”…Logical. Eastbourne’s form coming into this game was impressive. On curent form based on the previous six league games they were 4th out of the 24 teams in the league with four wins and two defeats. They had also scored 11 in their previous game here versus Crowborough in the Sussex County Cup and so fancied their chances against a York team who liked a draw. It wasn’t long before the home team took the lead as with just fifteen minutes on the clock as Ashley Barnes latched onto the end of a great through ball and poked the ball past keeper Ingham. This sent the York fans into a state of delerium as they proceeded to take their shoes off and start throwing them in the air in some kind of bizarre ritual. The stewards did not know what to make of the behaviour and were unsure whether to intervene or not. Not that the bizarre was limited to off the pitch. With two of the tallest teams in the conference playing out some nice football, the game was being officiated by one of the smallest referees I have seen – a Mr McLaughlin. No surprise with such a high disadvantage he felt overwhelmed by the players and so the yellow cards stayed firmly in his top pocket. The conditions made it tricky for both sides but Eastbourne especially tried to play some football on the ground. Eastbourne went in 1-0 up at the break and Lolly and I sought some sanctuary from the cold in the club house. Lolly is now a seasoned West Ham fan, and at the age of 8 is enjoying her first season as a West Ham season ticket holder. This does mean that she compares every football match and stadium to Upton Park and so is confused by practices at this level such as the fans “swapping ends” at half time. However, she does enjoy the closeness of games like this and was fascinated that the “York Bad Boys” were able to continue to behave in the way they did. Even Danny Last, he of European Football Weekends fame sent me a text to ask how the “York Ultras” were, and Lolly kept saying “There’ll be thrown out in a minute”…. Lolly sometimes asks those awkward questions that you dread. At half time she got me with a beauty. Answers on a postcard please… “A forward has a shot on goal that is so bad it is heading for a throw in. However, the ball hits the referee and goes into the net. Who is the goal awarded to?” 1. The forward; 2. The referee: 3. Neither – a drop ball is awarded from where the shot was taken: Anyway, Eastbourne started the 2nd hlaf in much the same way and scored a second from a corner when Ben Austin’s shot was pushed into the net by Ingham. Whilst York protested that the ball hadn’t gone in, our roving reporter (well me actually) can prove it did cross the line – see the pictures below for proof. Eastbourne’s comfort zone lasted just eight minutes before Christian Smith netted from close range which sent our York “bad boys” into a frenzy behind the goal and in the excitement (goals are not that common for them obviously this season) they decided to celebrate on the pitch. Queue a mass steward invasion and Lolly once again won a £1 bet as she said that by the end of the game at least 3 would have been ejected. Not much more happened in the final few minutes. With the sun firmly setting over the stand the temperature dropped quickly so with just a couple of minutes left we headed back to the car to collect the other Fullers from the beach and away we went, back to the smog of the big city. Eastbourne was a nice distraction from the Premier League and whilst it is hard to image a ground like Priory Lane hosting league teams every other week it is concievable that next season Luton Town and Bournemouth will be visiting the Golden Coast.